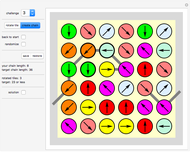 In the "Catenax" puzzle, try to build one chain comprising all of the given tiles on a wraparound board. Each tile is a compass that points to one of eight different directions. You can rotate a tile at a cost. The goal is to build a chain using all tiles while rotating as few tiles as possible. You get a "YOU WIN!" message if your chain covers the full board (with length 36) using no more rotated tiles than the target. There are two types of moves: "rotate tile" and "create chain". If you choose "rotate tile" before you click the main playing board, the tile on the clicked position will rotate 45° clockwise. The number of tiles that are rotated is counted, and the rotated tiles have a thicker black rim. If you select the "create chain" mode and then click the playing board, the system will form a chain, starting from the clicked tile. The chain cannot contain the same tile twice. Click "challenge" to choose from the five given setups. The "back to start" button takes you back to the starting position. Click "randomize" to change the arrow directions in the current setup. Use the "save" and "restore" buttons to save and restore a board setup you want to keep. The "your chain length" counter shows the length of your chain after clicking the "create chain" button. The "target chain length" counter shows the length of the board-covering chain. The "rotated tiles" counter is crucial! Keep the number of rotated tiles as small as possible. 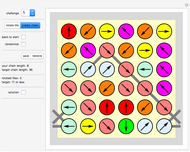 The "target" counter shows the maximum number of rotated tiles you need to win the game. Click "solution" to show the target chain. It does not matter whether you rotate the same tile more than once. The crucial "rotated tiles" counter is only increased once for each tile no matter how many times it is rotated. "Catena" is Latin for "chain". Karl Scherer "The Catenax Puzzle"